With next Monday a public holiday across all states and territories, excluding Western Australia and Queensland, auction activity is much more subdued this week, with 976 auctions currently being tracked by CoreLogic. Over the same week last year, 2,076 auctions were held, substantially higher, however the same public holidays were held the previous week, when a lower 1,201 capital city auctions were held. This week sees Melbourne, usually the busiest auction market, hosting 300 auctions compared to Sydney’s 400 auctions, while Brisbane is the next busiest capital city auction market, with 135 auctions scheduled, up slightly from 130 one week ago. With auction volumes so low in Melbourne this week, the two busiest auction locations this week are in Sydney. Mosman (11) and Millers Point (10) are the two suburbs hosting the most residential auctions, followed by New Farm in Brisbane, with 8 auctions scheduled. After falling to 67.7 per cent the previous week, the combined capital city auction clearance rate strengthened slightly last week, to 68.2 per cent. For the second week in a row, over 2,000 auctions were held across the capital cities. Across the individual capital cities, Melbourne (71.1 per cent) and Sydney (72.9 per cent) were the only two cities where clearance rates were recorded in excess of 70 per cent. 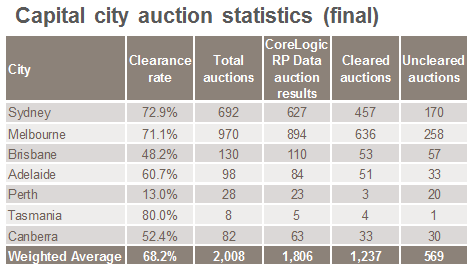 While across Wollongong, 76.9 per cent of the 13 reported auctions were successful. At a micro level, Sydney’s Eastern Suburbs (85 per cent) and City and Inner South (83.3 per cent) were the strongest performers. The Sydney regions of the Northern Beaches and Ryde and Melbourne’s Inner South followed closely with clearance rates for last week coming in at 79.6 per cent for each region. Adelaide and Brisbane both recorded a week-on-week rise in auction clearance rates, while in Canberra, Melbourne, Perth and Sydney, clearance rates fell when compared to the previous weeks result. Across the five regional markets that CoreLogic monitors auction results in, less than half of all reported auction results in the Hunter, Gold Coast and Sunshine Coast markets were successful.